Teotihuacan was one of the most remarkable cities of the ancient world. Today it's located 48km/30mi NE of Mexico City, and considered to be one of the world's great archaeological sites. In its day, it was massive, densely populated, and well organized. It was an important city for hundreds of years, and remained important to the Aztecs, though for different reasons than in earlier times. Teotihuacan (Teotihuacán) was not, of course, an Aztec city. By the time the Aztec empire was at its height, this great city had been around for over 1600 years. We actually know very little about the founding of the great city of Central Mexico. Of the buildings that remain, the oldest seem to be from about 200 BC (BCE). But it seems that it was a city of great power between 150 BC and 750 AD. At this time it became the 6th largest city in the world (after Constantinople, Changan, Loyang, Ctesiphon, and Alexandria). It's believed that the population was around 125,000 and up to 200,000. Researches have speculated that several small settlements may have joined around the lava tube cave, over which the sun pyramid (temple) was eventually built. Caves often held important ritual significance to the peoples in the area. This one may have become an important shrine because it had four chambers - a symbolic number. What we do know is that the city was brilliantly constructed. Large buildings and small, the wide central avenue, and careful organization are a part of what makes the ancient city stand out. 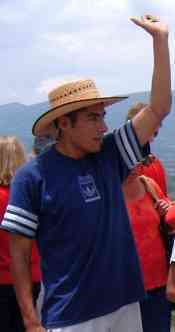 The city has been carefully studied, and researchers believe they have found at least 6 distinct social "classes" in the buildings of Teotihuacan (according to RF Millon). The city maintained a complex urban and economic structure. It held various kinds of craft shops, of course major religious activity, politics, and trade even with the farther off Mayan groups. Long distance trade involved bringing in raw materials that were not available locally. The city was divided up into separate compounds, each with its own little temple for local rituals. There were neighbourhoods where various craft shops would cluster. A study of the organization of the city even showed that there were ethnic neighbourhoods (a group from Oaxaca was found in a certain area during the Teotihuacan Mapping Project). Though the people of the city left little in the way of writings, they left a lot of architecture. These two temples (sometimes called pyramids) were two of the world's largest man made structures (read more about these temples here). 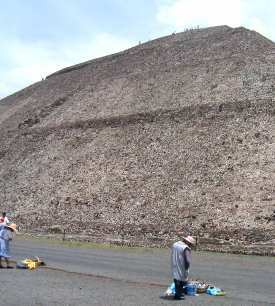 The pyramid of the sun may be one of the earliest structures in the city. Originally approximately 215 by 215 m at the base, and about 63 m high, it was enlarged at least twice over the course of its history. The builders of the city were brilliant stone workers and painters, leaving beautiful frescos, buildings and artifacts. Religiously, the system in Teotihuacan seems similar to much of Mesoamerica - a pantheon of gods, though a goddess was an important figure to them. It seems that human sacrifice was practised to some extent. They watched the skies and based their rituals on the movements of the planets. Religion in the city was a part of that stream of theology that the Aztecs would inherit. Around 750AD, something happened that would change the balance of power in central Mexico. Though it held significant power for almost 1000 years, that power was suddenly lost. What we know is that many buildings in the city were burned, and the city was never the same again. But what happened? As was mentioned, the decline of Teotihuacan was very sudden. Though it has been suggested that the city was invaded, it seems likely that there may have been a more internal war. The buildings that were burned seem to be those of the ruling class - government buildings. The city remained occupied - it doesn't appear that everyone left or was killed. As a matter of fact, the city remained populated right up until the Spanish conquest. It may be that discontent in the city led to an uprising, which displaced the rulers and weakened the city as a centre of power. Whatever happened, the city never again had the same political power that it once had. Teotihuacan became an important city to the Aztecs. They admitted they were in awe of it, and they incorporated it into their own religion and history by claiming that the current world had begun in the city. This was where the gods sacrificed themselves so that the world could be recreated (see this article about the Aztec sun god). In fact, they gave the city its name (meaning unclear - may be birthplace of the gods). 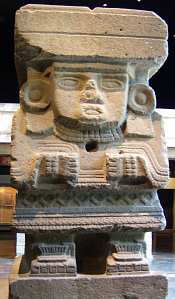 The Aztecs believed that the Toltecs built the city (its now believed that the city predates the Toltec civilization). The Aztecs claimed that the current age was created from Teotihuacan, and so named the two great temples after the sun and moon. Tower or mound of the sun and moon is what the Aztecs called the two great structures. It may be that the name of the city comes from a totally different legend. The Aztecs believed that rulers were once elected here, and laws were made. Eventually, like a Mesoamerican tower of Babel, different cultures left to begin life in other areas. Thus, the name may indicate that this was the place were men became gods or lords. (Much of the legends were recorded by Bernardino de Sahagún, a Franciscan who became a student of the Aztec peoples). Note: There is a theory that the name Teotihuacán was not original, and that the actual name that the Aztecs used was "Teohuacan", or city of the sun. For a brief discussion, see Mexico's Teotihuacan ruins may have been "Teohuacan". In the Aztec empire, this was a city like many others, with its own population and trade. It was a sacred city to the Aztecs, but also maintained a level of independence as a political city. The Aztecs took the styles that were seen in the city and used them in their own building projects. Objects from the city were exported to Tenochtitlán, where they were used in religious ritual. Today, the city is the subject of continued research, and a steady stream of tourists and curious or religious travellers. For a small fee you can explore the great avenue, climb the two great temples, visit the temple of the feathered serpent, and investigate many other structures. There is a fascinating museum and tiendas where souvenirs can be purchased. There's a great map of the city today from Google Maps and WikiMapia here for you to explore. The size and grandeur of the site makes it worth visiting today. You may need more than one day to really see everything this ancient city has to offer.